According to a report from The Lancet, exposure to polluted air, water and soil caused an estimated 9 million premature deaths in 2015. According to new research, environmental pollution is killing more people around the world than smoking, war or malnutrition. 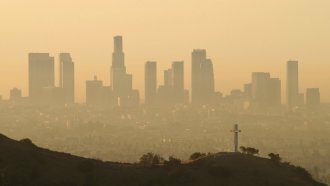 A report in The Lancet says exposure to polluted air, water and soil caused an estimated 9 million premature deaths in 2015. To put that in perspective, that's three times the number of deaths from AIDS, tuberculosis and malaria combined. And it's 15 times the death toll from war or other forms of violence. The report says pollution caused 16 percent of deaths worldwide in 2015 and that the vast majority of those deaths occurred in low- or middle-income countries. One of the report's authors told NPR that's likely because many of those nations are "galloping ahead with industrialization without paying attention to the consequences." Still, some areas, like New Delhi, have taken steps to make pollution control a priority, like tightening vehicle emissions standards and enforcing higher penalties for burning garbage.